The first thing to notice if you had installed the shortcut virus in your system is that it will be not get removed by your normal antivirus scanning it’s somehow stubborn. Shortcut virus usually creates the shortcut files, for example, Notepad.shortcut etc. So if you see such shortcut files in you Computer or Pendrive then this are the sure signs that you computer or pen drive contains the stubborn Shortcut virus. This is a kind of virus which will not get detected by normal antivirus. Today I am going to share you 3 simple tricks to remove the shortcut virus from your computer or Pen drive automatically. You can remove Shortvirus by using you command prompt or by installing a software. 1. In order to remove your shortcut virus with the help of your command prompt system, you need to follow the steps ahead. 2. 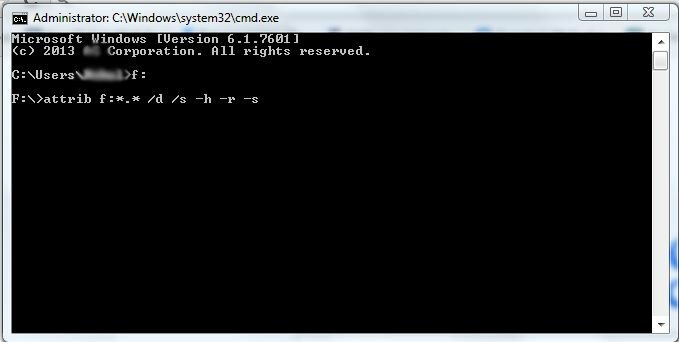 Open Command Prompt by pressing Windows + R and Enter “CMD” in the box and hit enter. 3. Now enter the following in your Command Prompt “attrib <Your USB drive>:*. * /d /s -h -r -s” without quotes ‘Your USB drive letter‘ must be replaced with your own drive letter. Suppose your flash drive is on Drive F so you must imply the following command “attrib f:*. * /d /s -h -r -s” without quotes and hit enter. 4. Now wait for some time until CMD finishes the command, once it’s completed successfully the shortcut virus will be removed from your PC. If you decided to remove your shortcut virus from your Pendrive or Harddisk with the help of a Software then you need to Download the software Named UsbFix in your computer. Cleaning- As we all know USB Devices are essential for performing daily tasks, and they are more prone to be infected. So UsbFix is the software used to cleaning junk files and shortcut virus from your external USB drives. Repair- It can repair the files that are already damaged by some virus or malware. UsbFix manages to restore the registry features and also repairs security features.it makes an autorun.if files in the USB Drive to protect against other infections that may occur in the future. Backup- Incase UsbFix had deleted the files that are already damaged it automatically makes a backup in the C:\UsbFix\Quarantine. which gives users an option to take back the deleted files. 1. Download UsbFix Software in your computer you can download the software by clicking HERE. 2. Install and restart your computer. 3. Connect Your USB Device which contains the shortcut or any other stubborn virus and then Run the Software. 4. Then click on Clean button. 5. After you clicked on Clean button wait until it cleans your shortcut virus from your USB Storage. After the completion Restart your computer again. It’s necessary to restart after the cleaning process because this tool makes some changes in the windows directory, which needs a restart. After that reinsert your USB Device again and you can see there will be no shortcut virus all are gone.